moje první loto s barvičkami ! Opravdu kouzelné veselé loto pro nejmenší - dětmi velmi oblíbené, doporučujeme ! Pokuste se být první, kdo zaplní svou hrací destičku ! Děti tak musí přiřadit nejen správný obrázek, ale i barvu - nenásilné pilování barviček a soustředění... Hra získala ocenění. 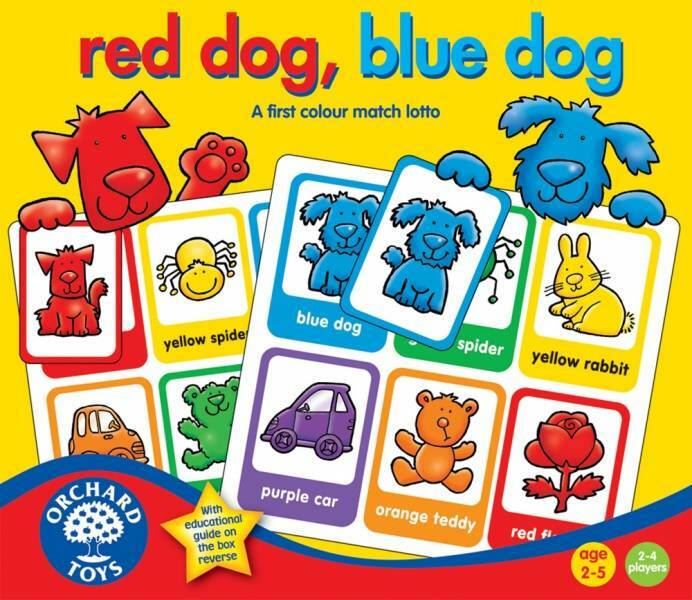 "We were lucky enough to be given Red Dog, Blue Dog and it was an instant hit with my son. He was two at the time and just loved looking at all the different cards (in fact running around with a fist full of cards is very attractive at that age). What impressed me however, is that he was prepared to sit down and engage in some basic rules. The aim of the game: Each player gets a board with six fun images on it. They take turns to collect the cards to match the images. A little bit bingo style. You can vary the rules to suit you (well, we do) and either turning it into a simple matching game (find the Red Dog), a chance game (turn over the next card and shout something like bingo if it matches your board) or a 'collect all the spiders/green cards' game. A great way to learn colours and to follow basic rules. My son is now almost three and of course still enjoys playing with it! "My kids love this game. We play it endlessly and they never get bored. Very simple, but very entertaining."